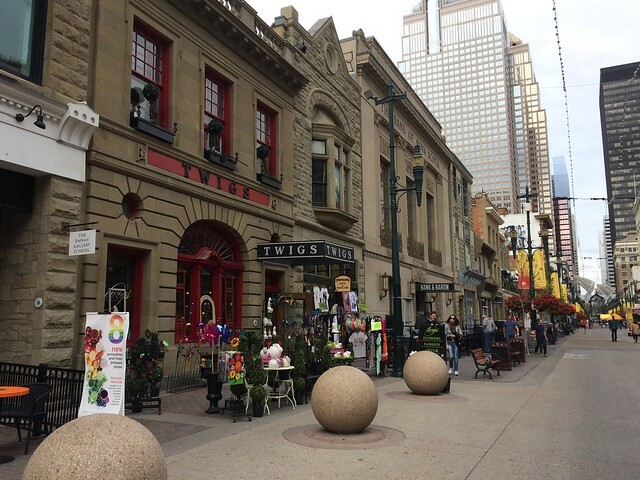 On our last day in Alberta, my sister and I headed into downtown Calgary to look around the shops and explore Canada’s fifth largest city. 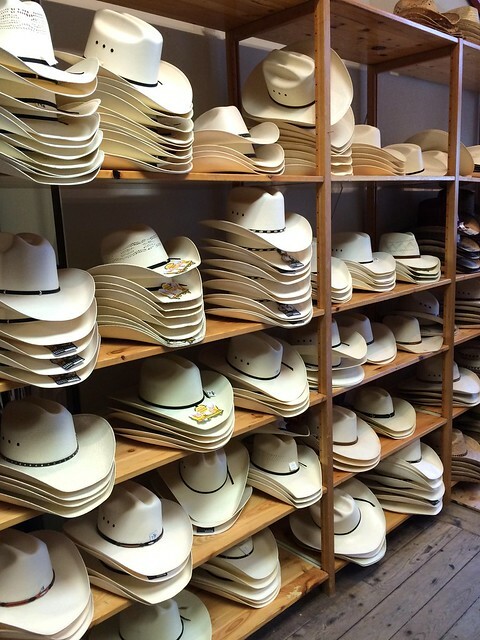 Of course, we had to stop into a cowboy store to look at boots and hats (and try on a few). The city is home to the world famous Calgary Stampede and you can see horse and cowboy imagery all over the design of the city. 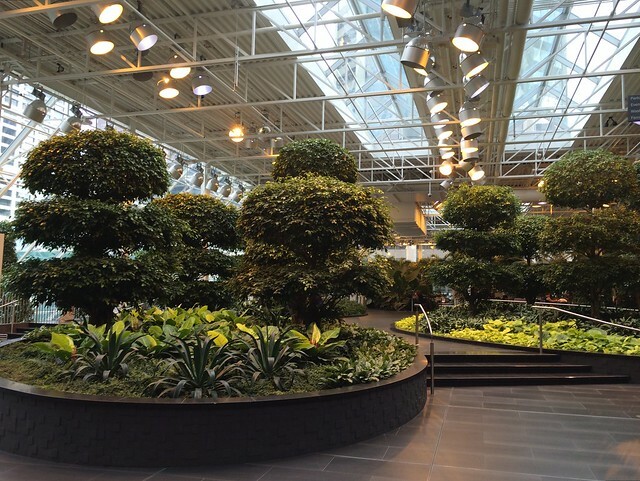 For lunch we popped into the Devonian Gardens at the CORE shopping centre. It’s an entire tropical oasis inside, complete with refection pools, a living wall and a giant indoor playground. 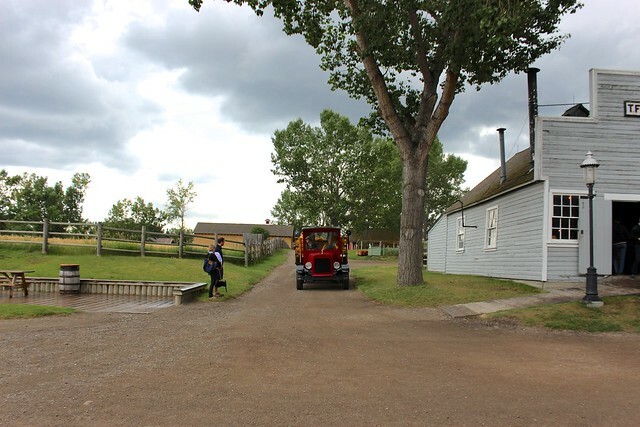 In the afternoon we met up with Alison and Dave again for the highlight of the day – a trip to Heritage Park! 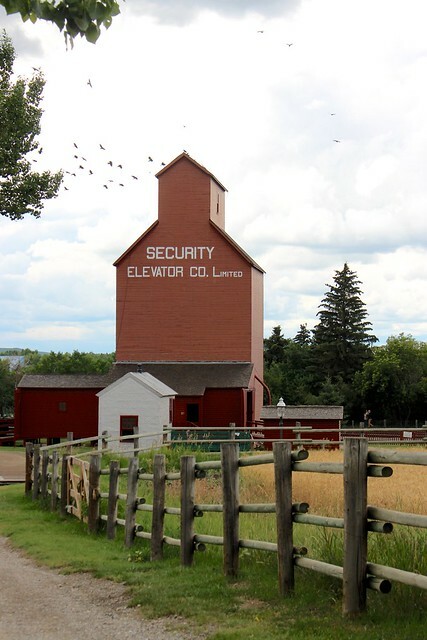 Established in 1964, it’s Canada’s largest living museum with over 127 acres of parkland just on the outskirts of the city. 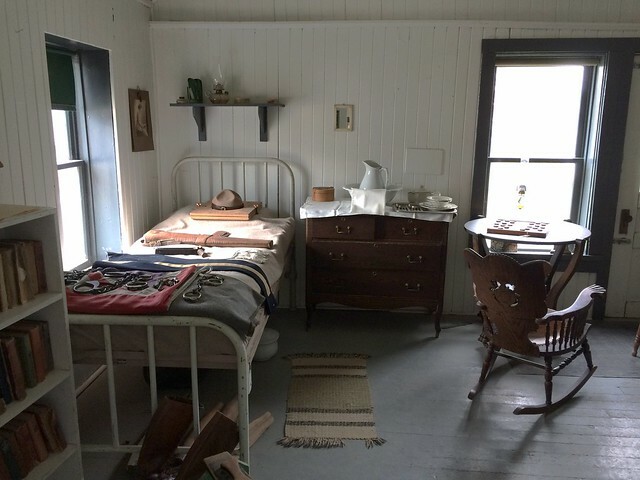 The exhibits span from the 1860s to the 1950s, but most of it seemed to be around the turn of the century – the same era as Cloverhill Farmhouse. As you can imagine, that got me pretty excited. 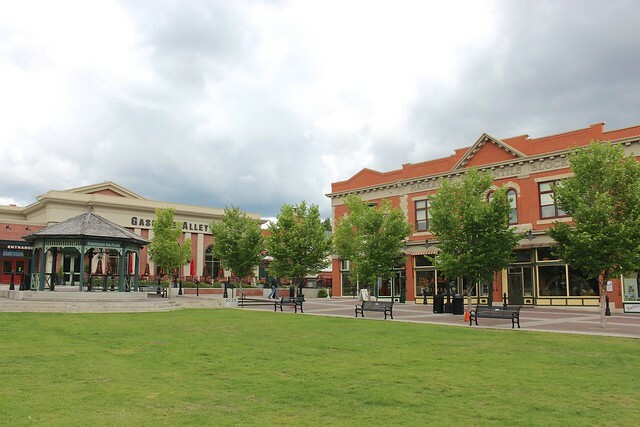 Although we didn’t have time to look around it that much, the entrance of the park is known as Heritage Square. 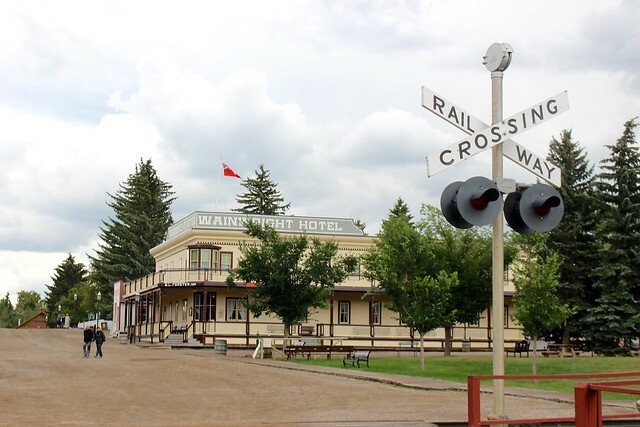 It depicts a typical 1930s Southern Alberta town square with a restaurant, cafe, microbrewery, shops and the Gasoline Alley Museum. Next time I go (and there will be a next time I’m sure), I hope to get the chance to check it out more. 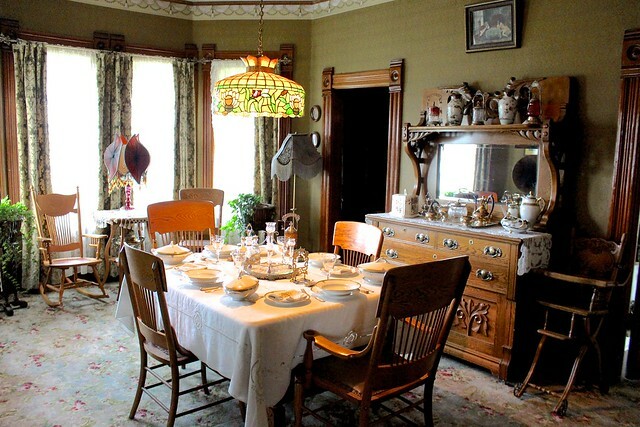 The first house we stopped to visit was built in 1894 using design blueprints for a cottage in Glenbrook, Connecticut published in an 1893 edition of Scientific American magazine. 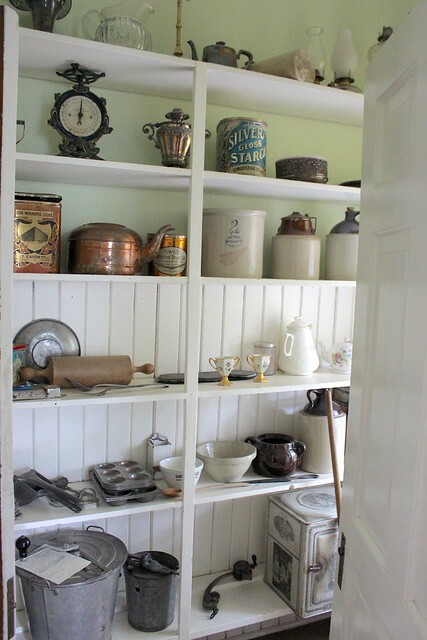 I loved popping my head into each room to see what antiques they had found and all the displays that had been set up. 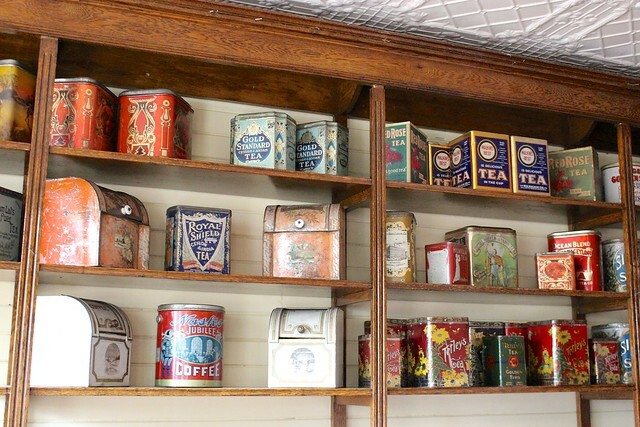 I would have loved to get my hands on any of these goodies for our open shelves in farmhouse kitchen. The kitchen had the same light and airy feel that I’m hoping to get in our own home. 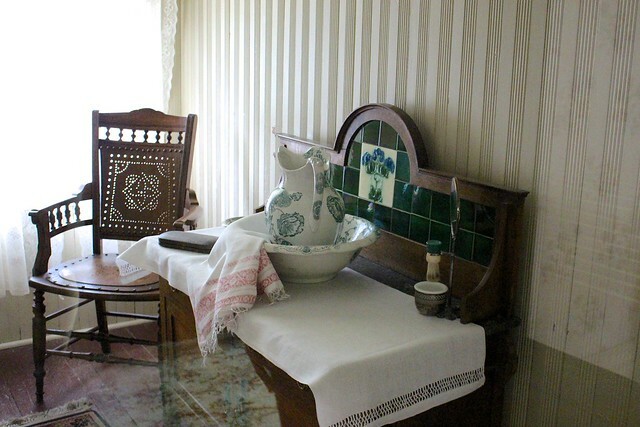 This water jug and basin reminds me of the ones my mother-in-law found for our own washstand. Can you tell I liked this house? By this point it was starting to rain pretty heavily, but I would have loved to walk around the Conklin Lakeview Amusement Park they’ve recreated with a vintage ferris wheel, carousel, bandstand, swings and more. 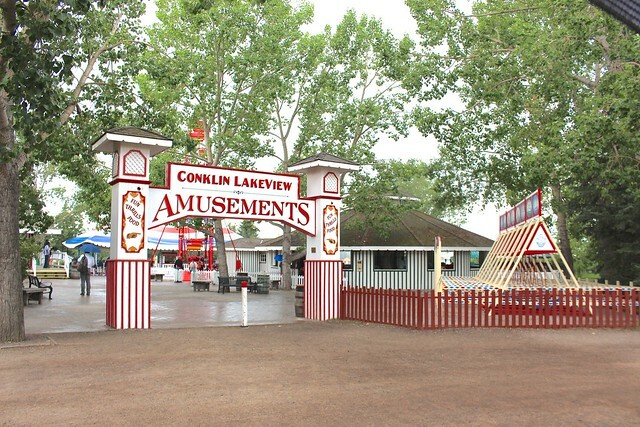 Most of the attractions were purchased by Jim Conklin for his antique midway exhibit for the 1978 Calgary Stampede and Canadian National Exhibition. He later donated many of the rides to Heritage Park where they were restored to be operational again. 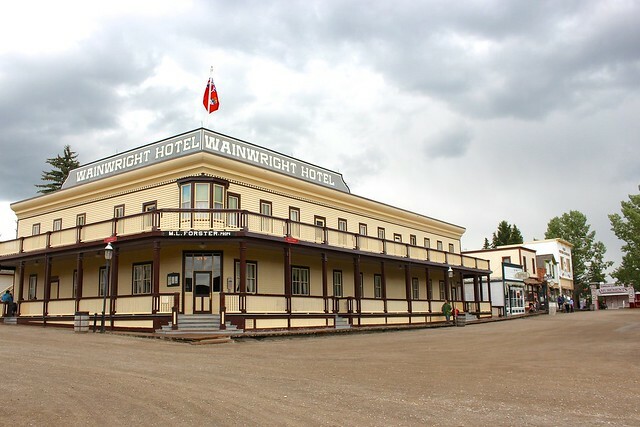 The 1910 Heritage Village boasts the Wainwright hotel, Botsford Harness Shop, Calgary Town Hall, Claresholm General Store, Gledhill’s Drugstore and a Post Office. A big hotel like this would have been the social headquarters of a small town like this. 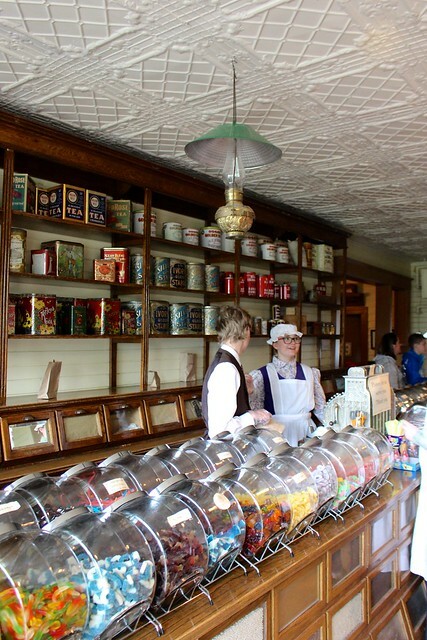 The shops were all carefully preserved inside, with beveled glass windows, an embossed tin ceiling and maple floors. You should have seen the line up of kids trying to get their hands on all the penny candies. While I didn’t get any candy, my sister and I did grab some wild blueberry jam to take back to our family and vintages posters (which you’ll see in my home tour this week). Just around the corner is a bakery, snooker bar, newspaper, home goods store and more. 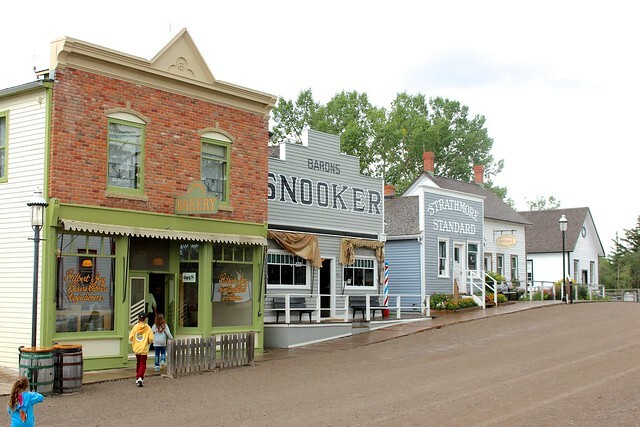 I’ve never been to a historical park that represented so much of the community that would have existed in this small Western Canada towns. 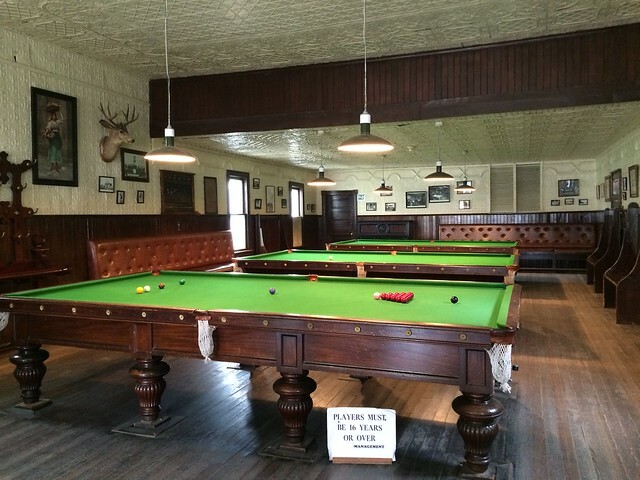 Wouldn’t it be fun to play pool here? And get a hair cut? 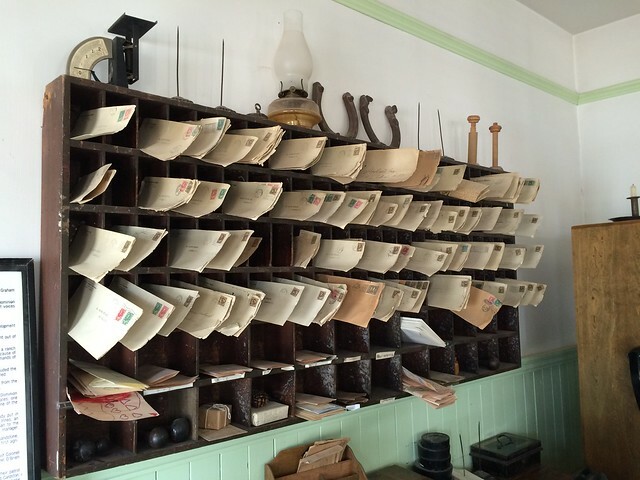 We popped into the post office to look around and learned that they still have an operational switchboard (to the right) that is connected to 16 lines in the park. Just down the street it continues with Calgary’s town hall, a dentist office, lawyer, Chinese laundry, cafe, bank, insurance office, blacksmith and fire station. 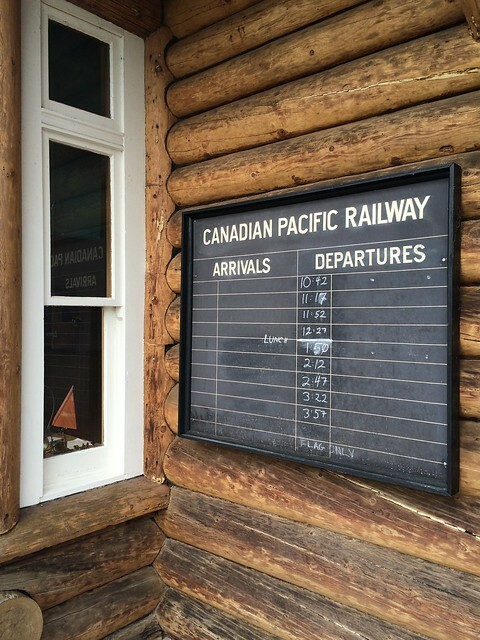 Most Chinese immigrants who arrived in Canada between 1881-1885, worked on the Canadian Pacific Railway. When the railway was done they often found they did not have enough money to bring their loved ones over or to go home themselves. 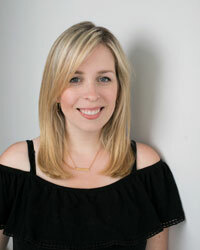 They found work in small businesses such as restaurants, laundries and grocery stores. 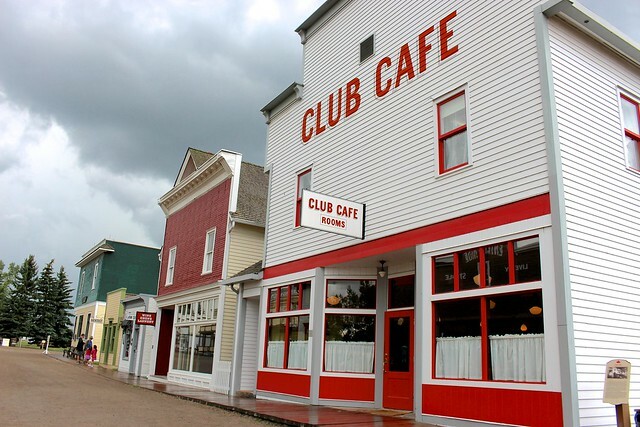 Club Café is an example of a popular Chinese café that was in almost every Western Canadian town. 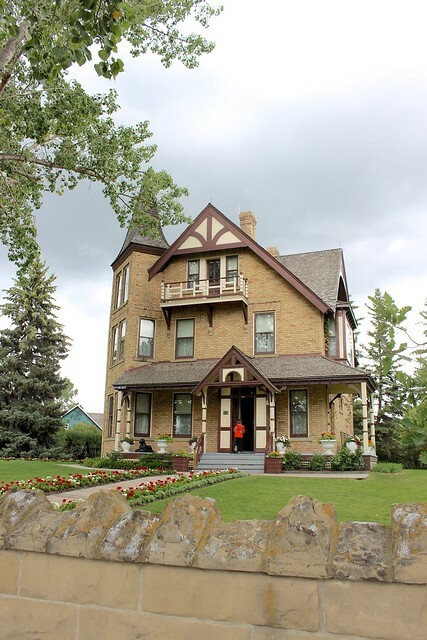 They serve the traditional western-style foods of the time – all-day breakfast, hot lunches and take-out sandwiches. 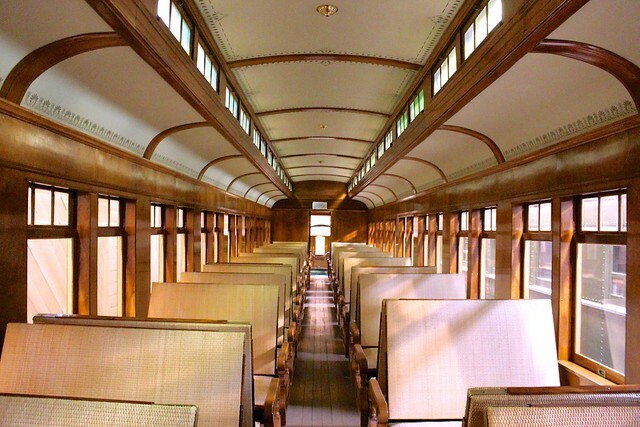 The interior has a lunch counter, curtained booths, tongue-and-groove siding and drop-style lighting fixtures. 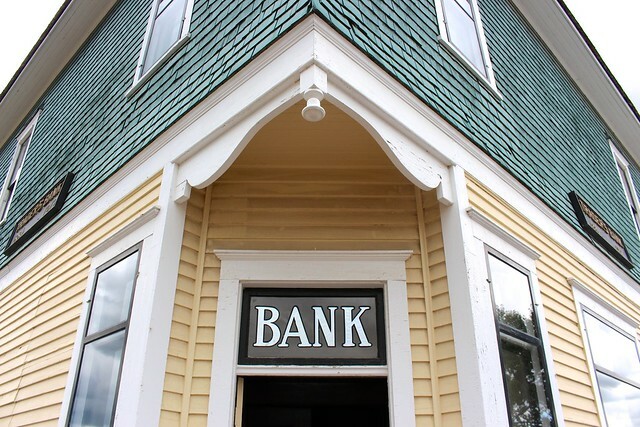 The detail and workmanship that has gone into recreating and preserving these buildings was really impressive. You really felt like you were in a small town, with the train horn blowing in the background. 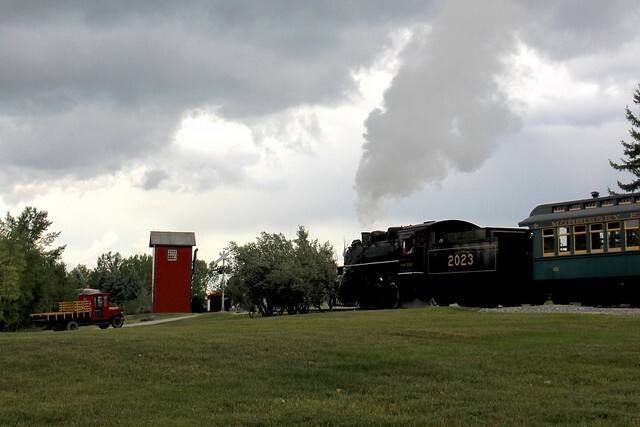 Throughout the park, restored train stations allow guests to hop onto a real steam engine to travel around the park to the various locations. It was pretty cool to get this up and close to a real train as it chugged along through the park. 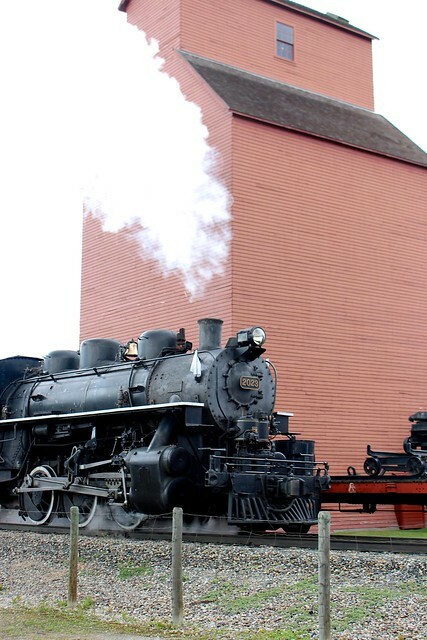 Heritage Park has a huge transportation exhibit, including a roundhouse, turntable and various passenger cars you can explore. We even got to see one that had been designed when the king and queen of England came to visit Canada once. 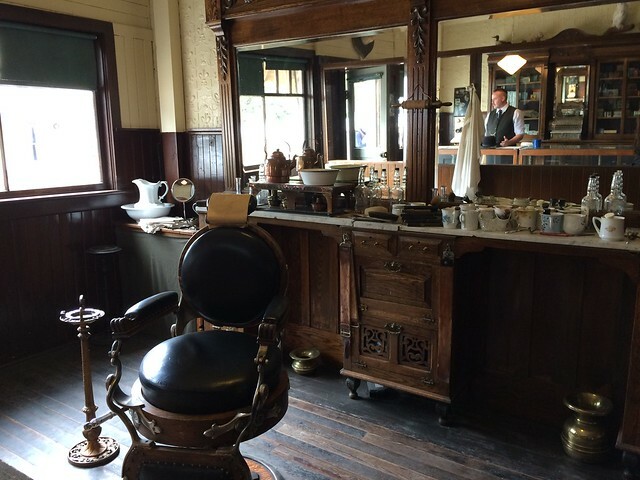 Everything in the park is made to make you feel like you’ve stepped back in time. We spotted some employees taking a drink break – and they were drinking from real glass coke bottles. Even the maintenance trucks are made to look like old farm trucks (left). All the little kids got excited when the maintenance trucks would drive by, with the workers dressed up in overalls and caps. I would never have thought about little details like that, but it does make a difference! 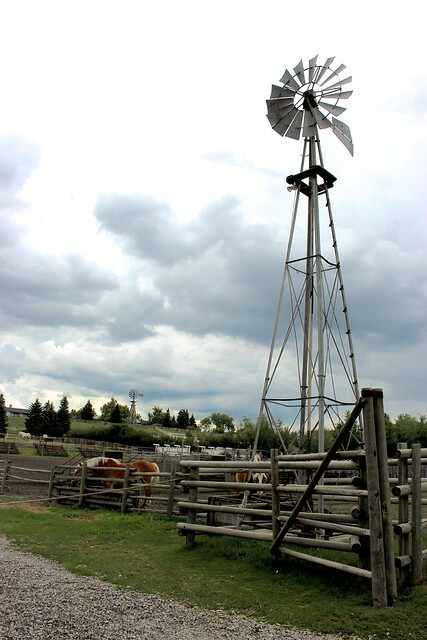 We continued through the park to the rural area of the park to learn more about ranch life in Western Canada. 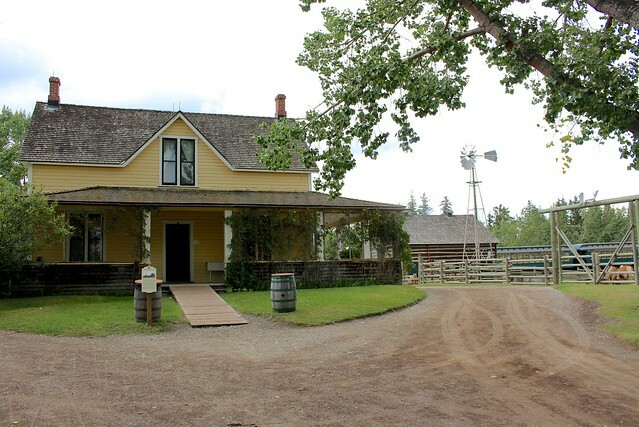 Burnside Ranch House is set up to show the importance of agriculture and ranching in this part of the country. The historical gardens and flowerbeds throughout the park showcase vegetables, flowers and herbs that were commonly grown in gardens for this era. They have heritage vegetables including Green Oak Leaf lettuce, Oxheart carrots, Scarlet Runner beans, Lutz Green Leaf beets and Large Manitoba peas. Flower gardens have historical species such as Siberian irises, day lilies, double poppies, hollyhocks, monkshood, clematis, peonies, geraniums and bleeding hearts. 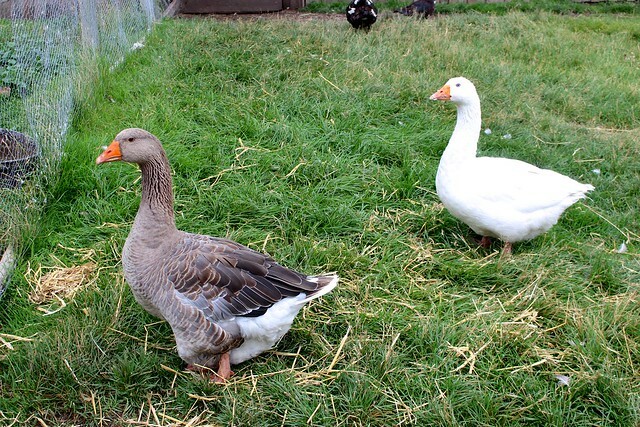 Winter wheat is grown and harvested in the fields and they have a variety of mixed farm livestock. 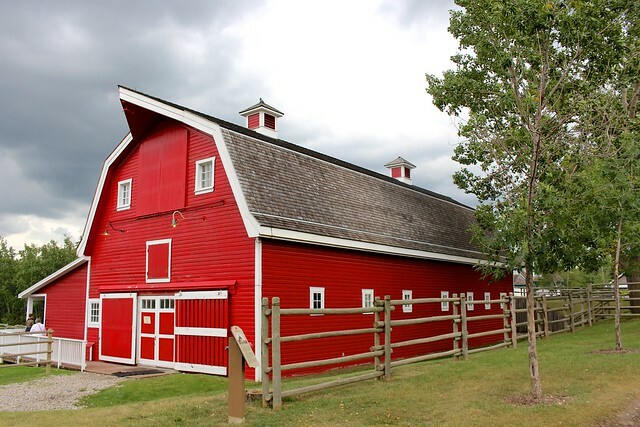 And a big red barn for them to live in. 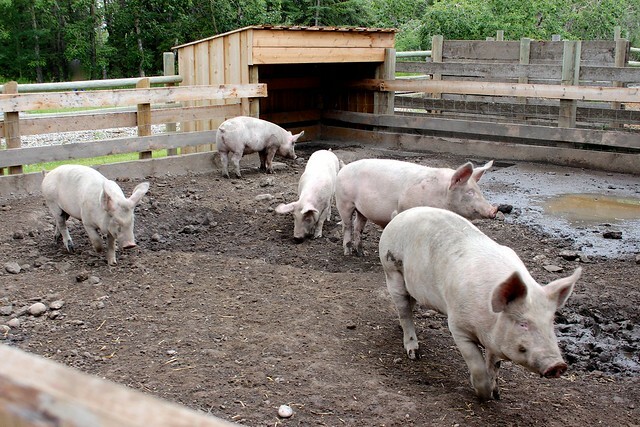 And some pretty muddy pigs. 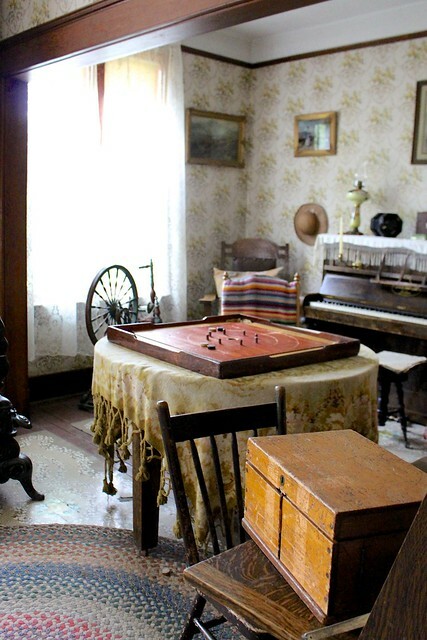 Inside the ranch I spotted one of my family’s favourite games – crokinole! Around back we found something that I had never even heard of before – a sod shack! 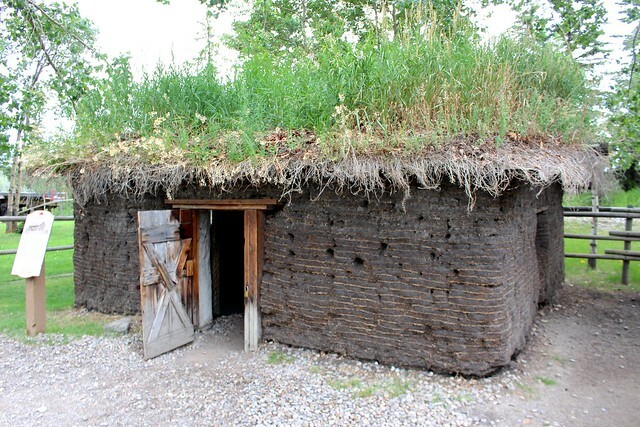 When settlers come out to the prairies they found that there were not enough large trees to make log cabins, so they started making their houses by stacking rows of sod on top of one another. Another sight we got to see was a real 1887 Mounted Police Post from the Banff National Park. 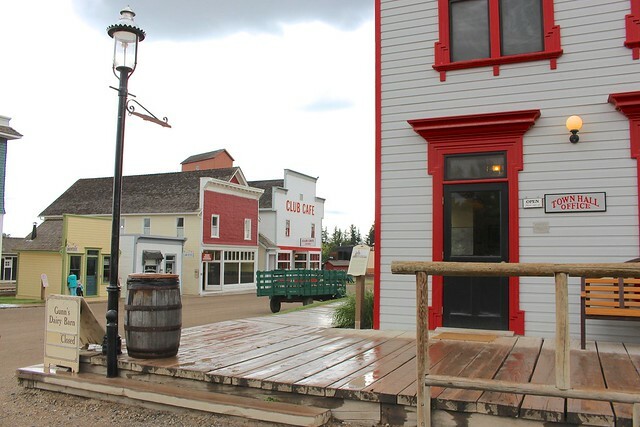 The North West Mounted Police were established in 1873 and sent west to establish law and order, making the area safe for settlement. On the bed you can see a press used to keep their famous hat brim straight! Farther into the park we came across an earlier era of homes, including this log cabin. 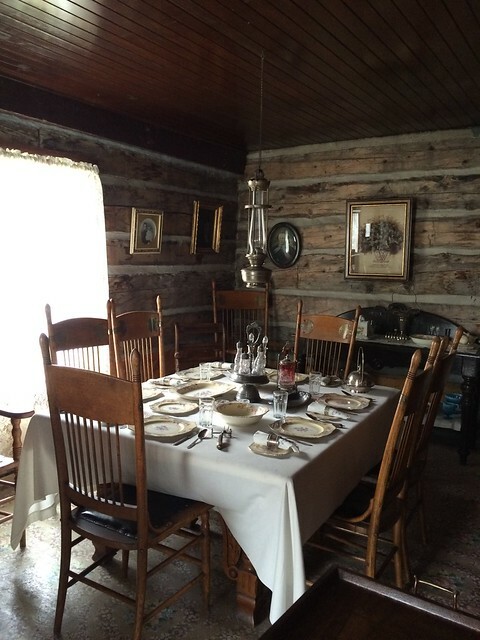 I loved the rustic walls mixed with the finer dining room set. 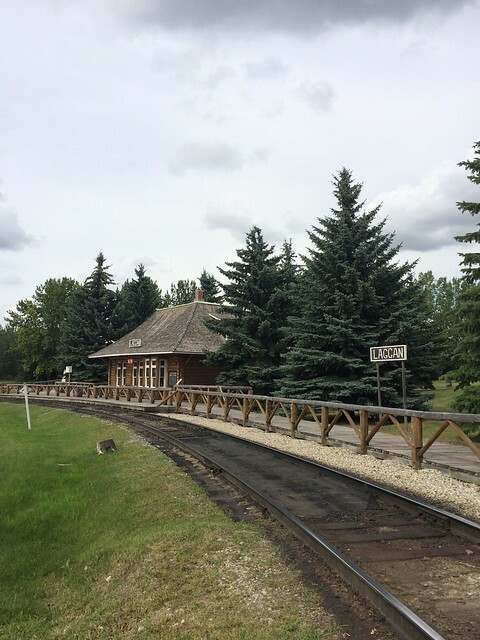 Just around the corner was the Laggan train station from Lake Louise. 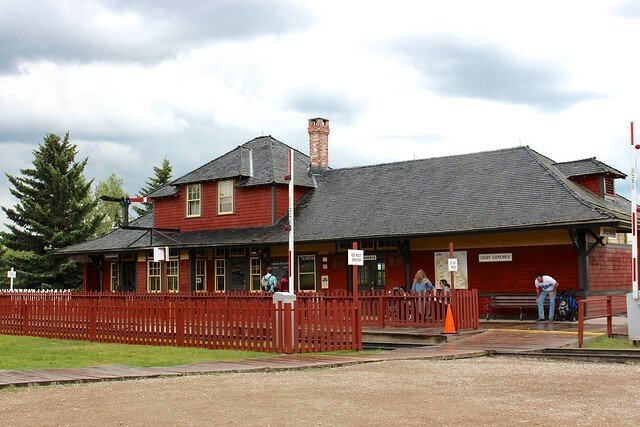 This station, along with one in Banff, were built by the Canadian Pacific Railway to attract tourists to the Canadian Rockies. It was built in a rustic style of the time period to add to the mountain lifestyle they were promoting at the time. 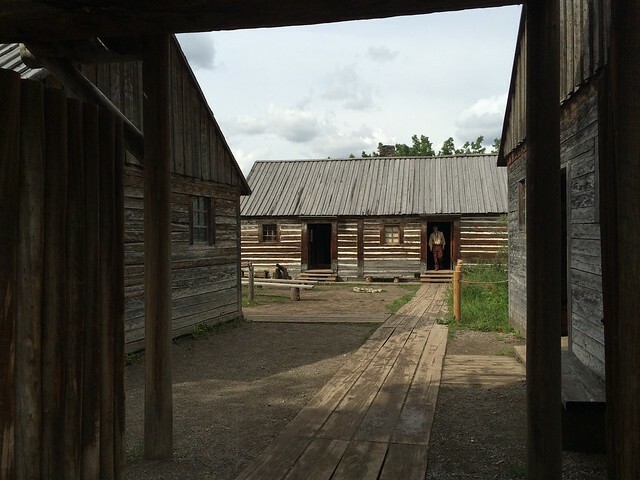 The last stop on our tour of Heritage Park was to the 1860s Fur Trading Fort and First Nations Encampment. 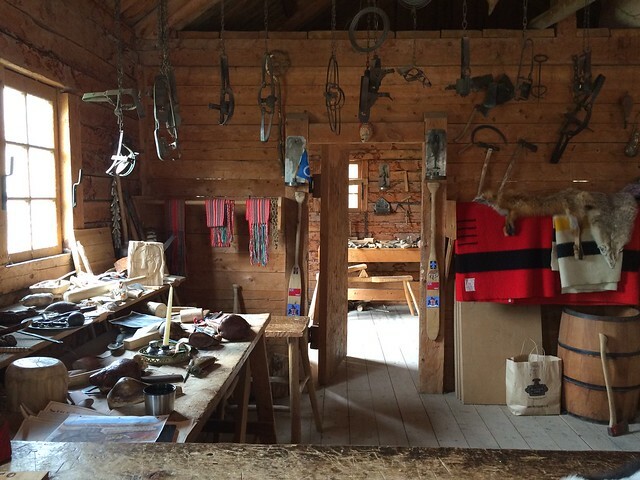 We were able to walk around the rustic setting and poke around in a Hudson’s Bay Company Fur Trading Fort. 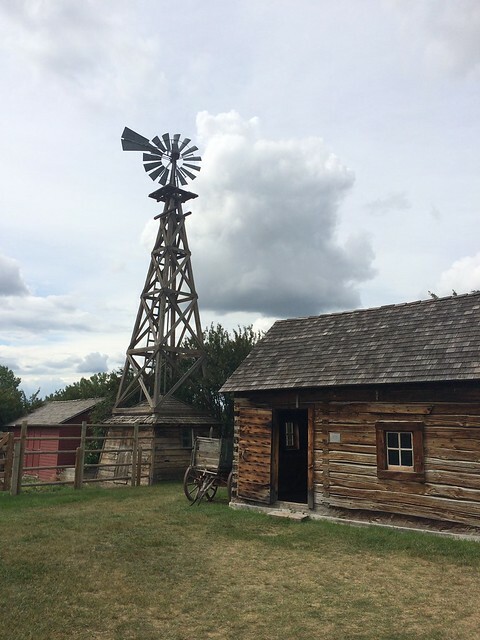 Our trip around Heritage Park was a blast and we had such a fun time learning more about the history of this area of the country. 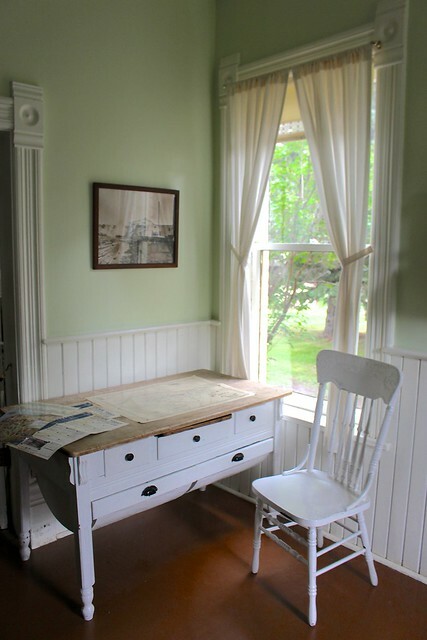 You better believe I took lots of photos to help us with our farmhouse restoration too. I’m always looking for ideas to help us keep it in tone with the era it’s from! Thank you to the folks at Heritage Park for letting us stop by for a visit. 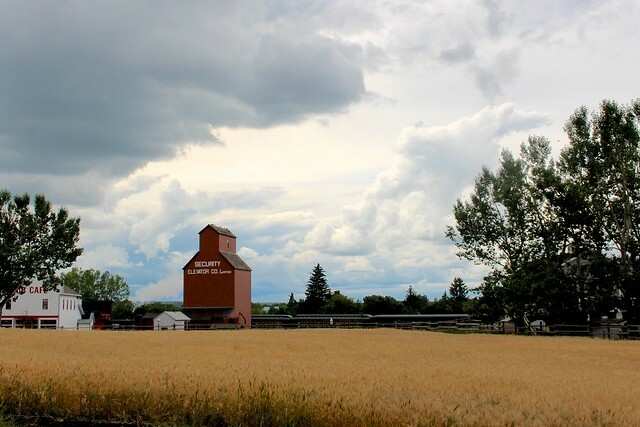 It you find yourself in the Calgary area it’s a must-stop for sure. I’ll definitely be back for another visit someday soon! Be sure to visit them on Facebook, Twitter and Instagram!